The new LED traffic light Atex, Mizar series, is result of research and development from Delvalle. 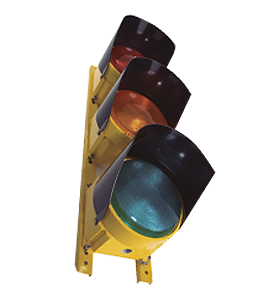 These LED traffic light ATEX, Ex d IIC traffic lights are suitable for regulating traffic in chemically aggressive industrial environments or potentially explosive areas classified as Zone 1 – 2 – 21 or 22. It is made of low copper content aluminium and features tempered glayss, coloured polycarbonate lenses and painted steel sun shades. The benefits offered by the new MIZAR system are as follows: lower maintenance costs (is estimated to be about one tenth compared with systems curriently in use), better visibility in critical conditions thanks to the LED lamps, better reliability thanks to the guaranteed continuous light even if one LED fails and, lastly, the lack of any “phantom”effect. Besides of LED traffic liight Atex, ou can check our extensive catalog of lighting Atex.